Set of 10 small sachets filled with dried French lavender (with no added chemicals). Each sachet is made of vintage embroidered linens. These particular linens are a mix of 100% linen fabric and rustic-looking fabrics (natural/unbleached, coarse weave, etc). They measure 2 1/4" square. These are great for keeping your dresser drawers smelling lovely. You can also throw these in your dryer to freshen your laundry. 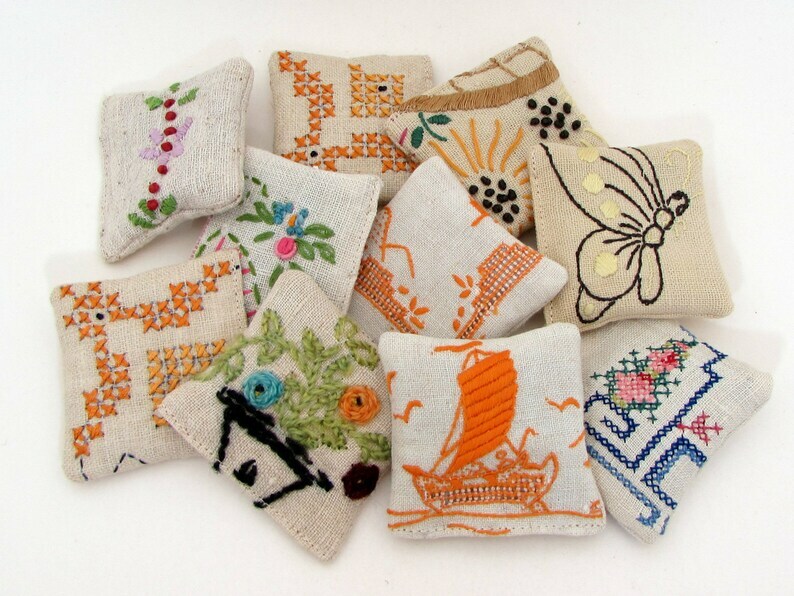 You will receive 10 sachets very much like the ones pictured here, made from the same assortment of vintage linens. These are individually packaged in cello bags, perfect for gift-giving, party favors, or stocking stuffers!